Was Mecca, Saudi Arabia, really the birthplace of Islam? From a historian’s perspective, evidence that Mohammad actually existed is scant as compared to other historical figures. Investigative historian Tom Holland attempts to find archaeological and literary evidence of Mohammad’s existence outside of the Qur’an and other Islamic writings. Using the Qur’an, he is led to the area of a very surprising, well-known biblical place as the potential birthplace of Islam. 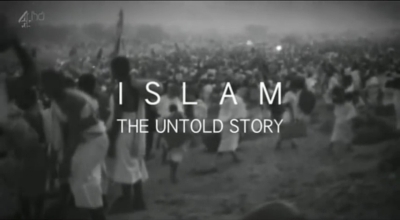 Now, considering that biblical prophetic geography and Islamic writings tell us that Islam is the religion of the coming Antichrist, I’m not sold on the idea that Mohammad didn’t actually exist but this documentary is interesting nonetheless. What it really does for me is highlight the grip that Satan is trying to maintain on this part of the world despite just about no evidence that he actually existed except stories passed on by word-of-mouth. Based on a book by Robert Spencer entitled “Did Muhammad Exist?”. I haven’t read the book (I simply have too many books to read) but here’s a review. Years ago, I watched in horror the conclusion of a documentary about ancient pagans who practiced child sacrifice. I suppose the producers were trying to make sense out of the beliefs of “worshippers,” who arduously traversed mountains, with victim children doomed to be sacrificed on the heights. What was the film’s sickening conclusion? The narrator GLORIFIED the murderous ritual! The footage spanned grand mountainous heights and sky’s expanse, while proclaiming – that HERE, where earth meets sky, the child’s death to the gods symbolized man’s reach for the heavens. Flowery words of folly, to soften the hateful history of child sacrifice. But the child’s evidence speaks the bitter truth: upon their little bodies, the clothing they wore, and the wrappings about their corpses, investigators found vomit and diarrhea. Sober evidences of their childish terror during the ghastly religious rite. The children never made glory out of their history! Believers in the One True God, Yahweh, and in His eternal Son, our Savior and Messiah, can exult in a GOD OF HISTORY. Real history — with the stamp of evidence, girded with truth and reality. And in a future history to come, where Yeshua, as our real King, will rule our real earth, in the real “city of the great king,” Jerusalem. Really? With respect to true history, we did not make our God, but He created us — and the world we inhabit. He always meets humans in their history. Jews and Christians glory in the GOD OF HISTORY. How delightful that God begins His Genesis word full of stories of individuals who made real history. How wonderful that He stayed in history, while the promised child Isaac, and the toddler who would become King David, were playing with their desert toys. From their human ability to generate offspring, “in the fullness of time” — in history — God sent, through the lineage of these historical folks, His Son to redeem us. In the riveting documentary, “The Exodus Revealed,” at this P2alm site, we see a real enslaved people Israel, led by a real God across a real Red Sea. We view the real Sinai in Saudi Arabia, its heights still blackened from the holy fire of God. We feel the terror of the Israelites fleeing through a narrow pass, only to discover they were trapped by a vast Sea. We rejoice in the historic golden Egyptian chariot wheels discovered in those waters. But, even more exciting, the awe we feel to learn that the very place to which God led Moses, was a wide plateau under water! From that broad, level highway, approximately two million Jews were safely brought across a path where, treacherously, a thousand-foot drop, or more, under water, flanked them on either side. Their God of history knew the exact right path in an impossible situation. Biblical historians love the fact that there is far more historical evidence for Christ’s life, than for Socrates or Plato, though the latter two are revered as greats in history. Back to the sacrificed child. No matter how one glorifies brutality and bloodshed for religion’s sake, history is telling. Dr. Bill Warner reports his exploration into ancient history texts and archaeological findings: 548 wars fought in Islam’s name, 270 million slaughtered over the centuries, countless humans made slaves, myriads of second-class oppressed non-Muslims, and ruined cultures. Alas, our historical times continue that torturous history. Holland cannot find concrete evidences about Muhammad, and he raises questions about Islam’s earlier role in Arab conquests of half of the world. Thus he concludes with respect for the power of religious tradition, whether real or fabricated, as being a good thing.